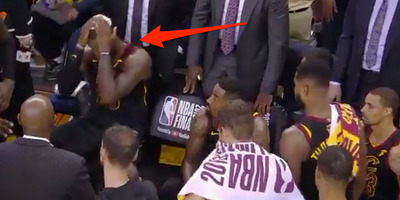 New footage shows the Cleveland Cavaliers in a depressed state before they went to overtime in Game 1 of the NBA Finals against the Golden State Warriors on Thursday. The moment was immediately after J.R. Smith’s crucial late-game blunder in which he forgot the score and dribbled out the final seconds of regulation instead of passing or shooting the ball. LeBron James in particular seems to nearly lose it after learning the Cavs had a timeout to spare. The Cleveland Cavaliers’ attitudes following J.R. Smith’s blunder at the end of Game 1 of the NBA Finals last Thursday were not good. New footage shows the Cavs returning to the bench to prepare for overtime against the Golden State Warriors, and it includes a lot of silence and blank stares. Smith had forgotten the score and dribbled out the final four seconds with the Cavs and Warriors tied at 107. Reports after the game indicated the Cavs were even more upset at the reversed charge call on Kevin Durant that awarded the Warriors two game-tying free throws. In total, in less than 40 seconds, the Cavs lost a chance to steal Game 1 on the road against a vastly superior team. During the huddle, LeBron James appeared to ask head coach Tyronn Lue whether the Cavs had a timeout remaining (meaning Smith could have called a timeout to get them an extra shot). When James learned they did, he nearly lost it. Somehow, the pain of that loss only seems to get worse.